port and regional specifications, for use in support of the UK Transport Security Programme. The STP unit also fully complies with regulations set by the European Civil Aviation Conference and can be used within European Union Countries. (A variant of the STP, the Combined Test Piece CTP was previously used). It is now a legal obligation within the EU to regularly test security x-ray screening equipment for image quality. The STP is designed to enable an operator to establish whether the x-ray machine is functioning correctly and that there are no obvious changes that might affect its performance to detect and display different densities of materials. Regular daily use of the STP prior to any luggage being screened or after the x-ray has been switched on, ensures that your equipment is working correctly. X-ray equipment may deteriorate over time and so regular testing will allow you to identify such deteriorations and rectify them before they can adversely impact upon security. The STP is in a carry case and must be placed into the x-ray without it being opened. 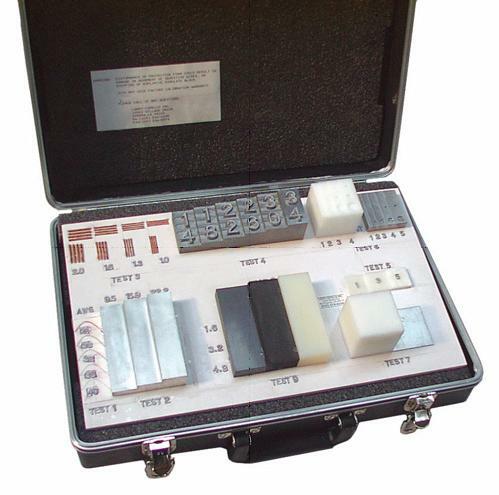 The STP incorporates samples of organic and inorganic material, plus resolution and penetration tests that are mounted and enclosed into a Perspex casing. The optimum position of the STP on the belt depends on the x-ray source and detector arrangements, with the aim being to obtain the best result possible. For some machines the STP may have to be raised to trigger the x-ray beam as it passes through the machine. Following its daily use, the STP must be removed from the x-ray with great care in order to avoid any damage or breakage, by ensuring that both hands are used, and that the STP is not picked up by the individual corners. Remember that the metallic substances contained within the STP are heavy and can create stress on the casing if not supported in a sensible manner. In the event that the lid retaining nuts do become loose, they must only be screwed to a light finger tight strength. Do not over tighten. The STP must be used in conjunction with a STP daily log sheet, which is used to record all the detailed observations. This daily log sheet will involve the operator recording, the date and time, the machine currently in use and its make and model numbers, what is seen on the x-ray images, and what options have been used. The STP may be viewed using any image enhancements available and may be passed through the machine as many times as the operator decides. For accountability purposes the daily log sheet must be signed by both the operative and the supervisor. The daily log sheet must then be placed in a file and retained, where it is available for inspection. Failure of some or all the tests may mean the video monitor, video signal or the x-ray apparatus could be at fault. If the results are still not satisfactory after the monitor has been cleaned, an engineer should be called. If the equipment appears to be giving poorer performance when compared to a previous test or there is doubt about whether a requirement is met, an engineer should be called. This fact must be recorded on the daily log sheet along with the steps taken to improve performance if appropriate. The equipment should not be used if the supervisor or line manager is not satisfied with the performance of the equipment. This must be recorded on the data sheet. The equipment may be used if the supervisor is satisfied that its performance meets all operating requirements.